Kerala rain, weather, floods Live Updates: Kerala CM Pinarayi Vijayan undertook an aerial survey of flood-ravaged districts of the state which have been battered by heavy rains since the past few days. Kerala rain, weather, floods Live Updates: 29 people have lost their lives so far due to rain-related incidents and landslides. 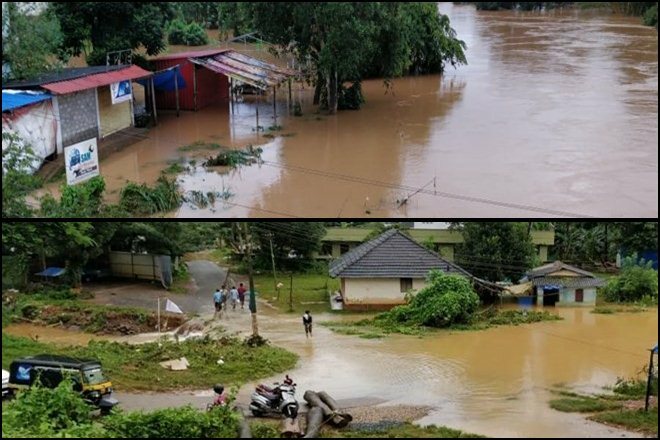 Kerala rain, weather, floods Live Updates: Incessant rains in God’s own country Kerala has claimed 29 lives so far as over 54000 people have been shifted to relief camps across the state. Earlier today, Kerala CM Pinarayi Vijayan undertook an aerial survey of flood-ravaged districts of the state which have been battered by heavy rains since the past few days. Due to inclement weather, CM Vijayan’s helicopter could not land at Kattapana in Idukki and instead landed in Wayanad. The Chief Minister had called a meeting to review the situation in the backdrop of the opening of five shutters of Idukki Dam. CM Vijayan has announced an ex-gratia of Rs 4 Lakh to the next of the kin of the deceased and Rs 10 Lakh compensation to those who lost their houses and land. Meanwhile, a red alert has been issued by the Indian Meteorological Department for 8 districts namely Idukki, Wayanad, Malappuram, Kozhikode, Palakkad, Kottayam, Alappuzha. But, in a major relief, reports today said that since the rains have slowed down, the water in the Idukki Dam has also receded. The water level at the Idukki dam was now at 2,401 feet after it came down on Friday night as the intensity of the rains decreased. Meanwhile, flight operations from Kochi airport are continuing uninterrupted and there has been no cancellations as per airport officials. The Indian Meteorological Department (IMD) on Saturday has issued a red Alert for Ernakulam, Palakkad, Malappuram, Calicut till August 12 and Orange alert till August 14. IMD also issued Orange alert for Kasaragod till August 13. Union Minister KJ Alphons on Saturday said that centre is providing all types of assistance to Kerala government. He further said that 11 out of 14 districts in the state are reeling under water. Speaking to news agency ANI, Alphons said, "11 out of 14 districts of Kerala are under water. Govt of India has sent armed forces & they have been on ground for past 3 days and have been helping state govt administration. NDRF teams have also been sent. PM has also spoken to CM about this." The Indian Meteorological Department on Saturday issued a red alert for Idukki till August 14 and orange alert for Wayanad till August 15. Red Alert has also been issued for Kannur till Aug 13 and Orange alert till August 15. Congress President Rahul Gandhi has written a letter to PM Modi on Kerala Floods, and has requested for financial assistance for the state government. Earlier today, Rahul Gandhi expressed concern over the flood situation in Kerala and urged party workers in the rain-battered state to help those in need. Kerala CM Pinarayi Vijayan announces ex-gratia Rs 4 Lakh to the next of the kin of the deceased and Rs 10 Lakh compensation to those who lost their houses and land. All the five shutters of the Idukki dam were opened yesterday. On Saturday, the inflow into the dam stood at 6,00,000 litres of water per second, while the outflow through the floodgates is 7.50 lakh litres per second. 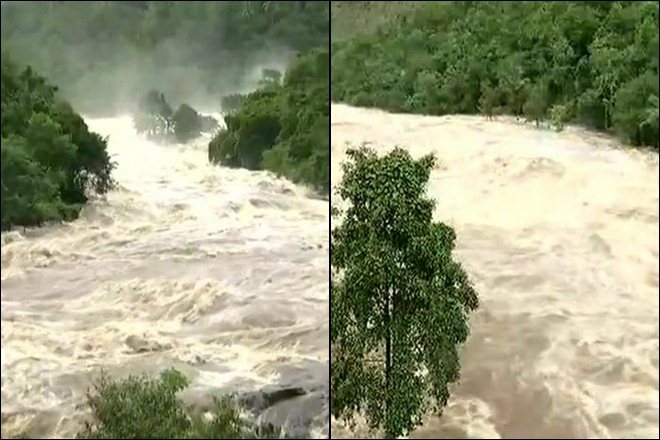 Thousands living around the Idukki dam and in Ernakulam and Thrissur heaved a sigh of relief on Saturday as the heavy rains predicted in Kerala did not happen and as a result, the Idukki dam waters ravaging the area over the last few days subsided. State Power Minister M.M. Mani said that the rains have slowed in and around Idukki dam since last night and hence, the water level in the dam has also receded. The water level at the Idukki dam was now at 2,401 feet after it came down on Friday night as the intensity of the rains decreased. Congress President Rahul Gandhi today expressed concern over the flood situation in Kerala and urged party workers in the rain-battered state to help those in need. He said the unprecedented rainfall has wreaked havoc in the southern state, destroying property and forcing thousands to abandon their houses. " I urge each and every Congres worker in Kerala to step up and help those in need. My prayers and thoughts are with the people of Kerala in this difficult time," he said on Twitter. Unprecedented rainfall has created havoc in Kerala, destroying property & forcing thousands to abandon their homes. I urge each and every Congres worker in Kerala to step up & help those in need. My prayers & thoughts are with the people of Kerala in this difficult time. A red alert has been issued for 8 districts-- Idukki, Wayanad, Malappuram, Kozhikode, Palakkad, Kottayam, Alappuzha of the 14 districts in the state by the Indian Meteorological department. Over 54,000 people have been shifted to relief camps across the state. Kerala CM Pinarayi Vijayan and leader of opposition Ramesh Chennithala arrive at Wayanad. The chief minister would be visiting a relief camp and attend a review meeting at the collectorate. Chief Minister and team, who are on a visit to the flood affect areas of the State, have landed in Wayanad. Twenty-nine persons have so far lost their lives in the heavy rains since August 8 and over 50,000 persons have been shifted to relief camps. A red alert has been issued for 8 districts-- Idukki, Wayanad, Malappuram, Kozhikode, Palakkad, Kottayam, Alappuzha of the 14 districts in the state by the Indian Meteorological Department. 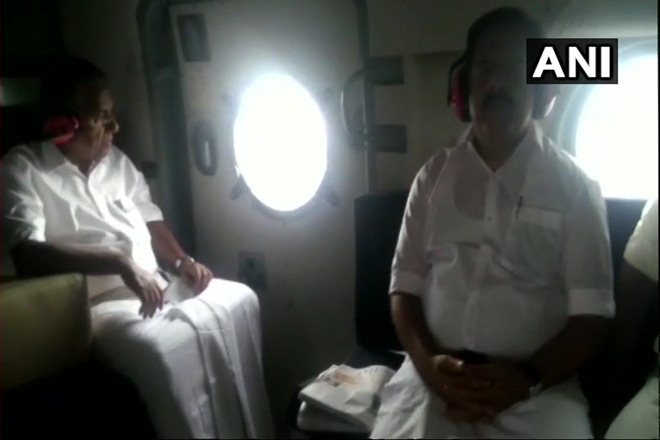 Kerala CM Pinarayi Vijayan conducted aerial survey of flood-affected areas of the state, leader of Opposition Ramesh Chennithala is also with him. They were supposed to land at Kattappana in Idukki but were forced to move to Wayanad due to bad weather conditions. Visuals of flooded Panamaram village in Wayanad district. 29 people have died in the state due to flood and landslides following heavy and incessant rains. 5 shutters of Idukki dam were opened yesterday. The water level of the dam, reported at 6 am today, is 2401.16 feet with its full reserve level being 2403 feet. As many as 29 people have lost their lives in flooding and landslides, following heavy and incessant rains. The heavy deluge has also left 54000 people homeless. The Southern Naval Command at Kochi has rescued scores of people stranded in the flood-hit areas of Kerala as part of the Indian Navy's "Operation Madad" for the rain and landslide-ravaged state. The Army pushed its men and machinery into disaster relief and rescue operations at Kannur, Kozhikode, Wayanad and Idukki after incessant rain and landslides hit various northern districts of the state, IANS reported. Thrippara Thrikovil temple premises has reportedly been submerged as Achankovil river is known to have flooded its banks. CM Pinarayi Vijayan visited the flood monitoring cell in State Secretariat and reviewed its functioning. Meanwhile, Union Home Minister Rajnath Singh will visit the state on August 12. Kerala issues red alert for eight rain-hit districts. Amid heavy rains in the state, the government has taken the decision. Dam reservoirs and rivers overflowed, sections of highways collapsed and homes were swept away in severe flooding in more than half of Kerala, after days of incessant rains left nearly 54,000 people homeless and killed at least 29, PTI. Kerala CM Pinarayi Vijayan has appealed for contributions to the CM Disaster Relief Fund. "Kerala is in the midst of an unprecedented rain havoc. Path to recovery can be long & arduous, but you can make a difference by joining the rebuilding efforts. CM Pinarayi Vijayan has urged all to contribute generously to the Chief Minister's Distress Relief Fund," tweeted Vijayan. Fourteen National Disaster Response Force (NDRF) teams are being deployed in the rain-battered state for rescue operations, a spokesman of the force said. Each team has about 45 personnel. As the situation in Kerala is grim amid heavy rains, Union Home Minister Rajnath Singh will visit the state on August 12, ANI reported. Spoke to Kerala CM Shri Pinrayi Vijayan and discussed the prevailing flood situation in the state. I have assured all possible assistance from the Centre to the state government. The relief and rescue ops are going on. MHA is closely monitoring the flood situation. Rainfall around Mullaperiyar dam has recorded a decrease since yesterday. As all the 5 shutters of Cheruthoni dam have been opened in the wake of heavy rainfall, water volume has increased to 5,00,000 litres per second. 'The ongoing rainfall activity over Kerala, Karnataka and Ghat areas of Tamilnadu is likely to reduce in intensity from today. However, a furtherincrease in the intensity of rainfall is likely during 13th­15th August in association with a fresh surge of monsoon westerlies,' said IMD forecast. Puducherry Chief Minister V Narayanasamy spoke over phone to Pinarayi Vijayan and assured him of all help to tackle the situation there in the wake of torrential rains. Eminent scientist and former ISRO chief G Madhavan Nair believes the monsoon fury in Kerala might be a part of "global phenomena" but local factors like deforestation and "invasion" of mountain slopes contributed significantly to flash floods and landslips in the state, PTI reported. With all the five floodgates of the Idukki dam opened, water is rushing down the Periyar lake causing huge loss to the crops and properties. The worst affected is the Cheruthoni town, located nearest to the dam. The Navy has put on alert its Southern Naval Command in view of the rising water level in Periyar river in Kerala and a possible inundation of parts of Wellingdon Island, surrounded by the backwaters of Kochi. "We will take all necessary steps to ensure that important installations in the island are not affected," a defence spokesperso'n. Idukki Dam authorities have opened all 5 shutters; water gush at 4 lakh litre per second. An alert announced to people living along the banks of Cheruthoni and Periyar rivers. All 5 shutters of Cheruthoni dam have been opened in the wake of heavy rainfall. Idukki, Ernakulam and Thrissur districts have been alerted. People are being evacuated from the areas near Periyar.